I’ve written before about why I try to avoid tourist traps. When visiting a city for the first time, the last thing I want to do is to spend time in a restaurant that locals disdain. Are there tour buses lined up outside the restaurant? Then the place is not for me. But, as it turns out, there are exceptions to the rule. One prime example: Buhara 93. This restaurant is located around the corner from the wonderful Erguvan Hotel, where I stayed in Istanbul. 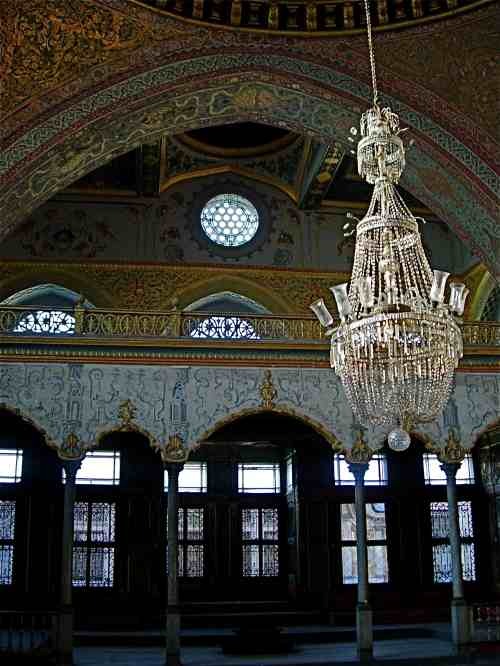 Both are located in Sultanahmet, the oldest part of the ancient city, situated on the European side of the Bosphorus. This district is filled with wonders, many of which are within easy walking distance of the others: Hagia Sophia, the Blue Mosque, the Basilica Cistern, the Hippodrome. There were tour groups parading in and out of the attractions, of course, but I also noticed that buses would wait outside of Buhara 93 every night. As if that weren’t bad enough, the restaurant was mentioned in every guidebook I picked up. Then, on the last night of my stay, my schedule ran very late. Back at my hotel, I knew I needed to grab dinner somewhere, but wasn’t sure what to do. Suddenly, the proximity of Buhara 93 seemed, if not alluring, then at least appealing. Inside the restaurant, I had my first surprise. I handed the host my Turkish celiac card, and he exclaimed, in English, “Celiac disease! Yes, we know this!” He was familiar with the disorder, simply because, with so many tourists from various countries coming through, he and the rest of the restaurant’s staff had encountered it many times before. He was able to point out to me what would be celiac-safe on the menu. There weren’t many choices, but the tomato salad and lamb kebabs I had were delicious. Buhara 93 doesn’t serve alcohol, but they do offer fresh-squeezed juices, including a pomegranate drink I wished I could take home with me. I had a great meal, but also an important lesson: sometimes it pays to check out spots that specialize in the tourist trade. Lesson learned. Last weekend I spent some time with a friend I haven’t seen in months. While we were catching up, she asked about my trip to Turkey last November. 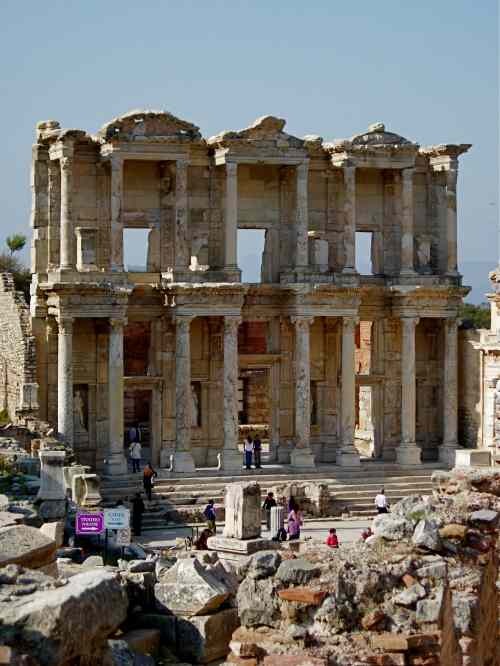 I told her about the astonishing ancient cities I saw — Ephesus, Aphrodisias, Hierapolis, Pergamum — and about the beauty and history of Istanbul. But I found myself talking even more about Oya Özden and her family. Oya also invited my husband and me to have dinner with her, her husband, Hasan, and their daughter, Nil. (Oya and Nil are pictured above, with me.) They took us to a banquet hall on the Asian side of the Bosphorus. The dining room was full of celebrations (I counted one wedding, one 45th wedding anniversary, and one high-school reunion). There was no set menu; instead Oya had made special arrangements in advance (her celiac support group has met at the banquet hall in the past). For us, the kitchen staff baked gluten-free pide, a substantial bread that looks like a giant waffle; I’d seen it on menus throughout my trip, but this was the first time I was able to try it. There were also appetizers that consisted of a wafer-thin gluten-free bread topped with lamb, parsley, and spices. Oya had arranged for gluten-free mezes, which included hot peppers, yogurt seasoned with garlic, rice-stuffed vegetables, a hot tomato sauce, and a dish of leeks and carrots, all of which were delicious. The main course was lamb, and for dessert there were several treats, including dates filled with cheese. I also tried raki, Turkey’s unofficial national drink, for the first time at dinner (similar to ouzo but not sweet). It was a fabulous evening from start to finish, partly because of the great food but mostly because of the wonderful company. Meeting Oya reinforced for me how important it is for the gluten-intolerant to share information and advice. It also made for the most memorable night of my trip. Thanks again, Oya, Hasan, and Nil! Before I left for Turkey, I e-mailed a friend for advice. Like me, Alison is a travel writer — her blog is called A Curious Mind, and she’s penned articles for everyone from The Washington Post to The Huffington Post — and she had visited Turkey a few weeks before me. It turned out that her trip was a whirlwind press tour — she only spent three days there in total. Still, she had plenty of suggestions for what to see and do. 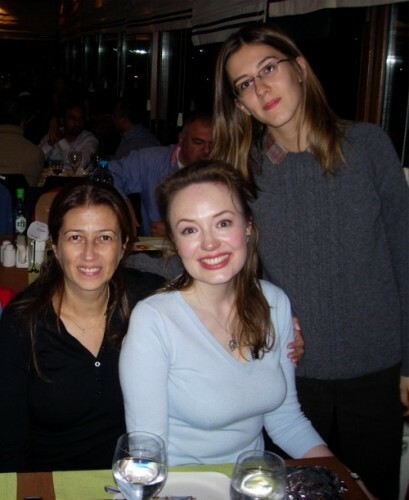 Her one restaurant recommendation was for Hamdi, an Istanbul restaurant that is close to the Eminönü ferry docks. “They had a pistachio kebab that I cannot stop thinking about,” Alison told me. 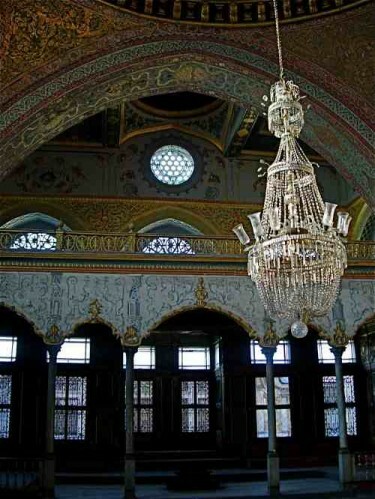 While I loved the places that she mentioned (including Topkapi Palace, home to many of the Ottoman sultans), I wondered whether Hamdi would work out. Perhaps I’d had good luck with restaurants early on in the trip, while I was in Selçuk, in part because I was visiting in November, technically the off-season for Turkish tourism. Restaurant owners and staff had taken good care of me, but on a couple of those nights, my husband and I had been virtually the only people in the restaurants. Hamdi is listed in every travel guidebook, and it’s popular with locals — everyone wants to enjoy its spectacular views of the Galata Tower and the New Mosque (otherwise known as the Queen Mother’s Mosque). Would a crowded, busy restaurant be up to the task of preparing a gluten-free dinner for me? It turned out that I needn’t have worried. The night that we dined at Hamdi, the fourth-floor dining room was packed and we scored the last available table. I was amazed that, even in such a busy place, all of the staff read the Turkish celiac card I had with me. After a quick huddle, two waiters were assigned to my table — the one who was working in that section of the restaurant, and another who was serving a different section, but who spoke very good English and could translate my needs to the kitchen. I ended up having an incredible kebab, a mix of lamb and veal with pistachio nuts, served with a tomato salad. Because every dessert on the menu featured pastry (Hamdi is famous for its baklava), the kitchen prepared a fresh fruit salad for me. It was a luxurious meal, even thought the restaurant isn’t an expensive one. And now, like my friend Alison, I can’t stop thinking about that amazing pistachio kebab. It’s hard to describe just how rich Istanbul’s history is. Everyone knows that it’s the city where East meets West, literally: part is in Europe and part is in Asia, with the Bosphorus Strait dividing the two. I was enthralled by Hagia Sophia — or Ayasofia, in Turkish — the great church built by the Byzantine Emperor Justinian in 537 (it’s now a museum). Across the street from it is the Sultanahmet Mosque (also called the Blue Mosque), built by Sultan Ahmet I in 1617, famous for its stunning tiled interior and six minarets. 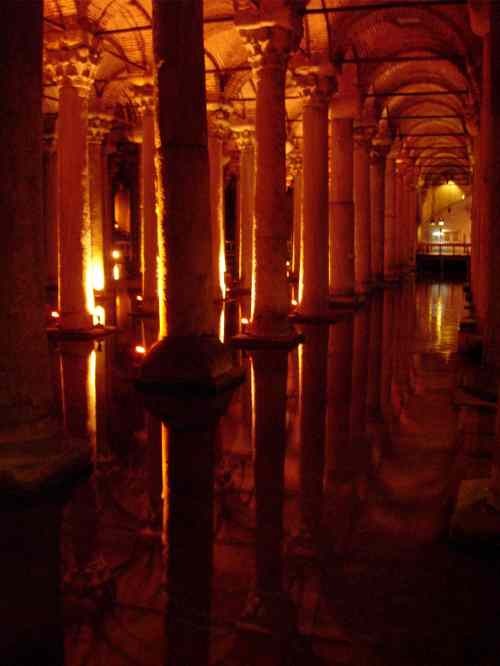 But the most surprising place, to me, was a treasure that was forgotten for centuries beneath the bustling city: the Basilica Cistern. At roughly the same time Hagia Sophia was constructed, Justinian expanded and rebuilt the cistern, which had been created during Emperor Constantine’s reign. While its purpose was purely functional — the cistern served as a reservoir for the city, capable of holding 27 million gallons of water — its form was a work of art. Justinian’s builders reclaimed 336 columns from local Roman ruins to support the cathedral-like brick ceiling. It’s hard to believe, but this subterranean Byzantine treasure was forgotten in the Ottoman age. Rediscovered in the 20th century, it was repaired and opened as a tourist attraction in 1987 (after being used in the 1963 James Bond film From Russia With Love). I discovered over dinner why they were so thrilled with the celiac card. A few weeks earlier, a tourist who had a food allergy had dined at the restaurant, but she hadn’t told the restaurant staff about her issues and they watched, horrified, as she had a serious reaction to the peppers in her dish. The staff was relieved — grateful even — to find out what my dietary issues were and were happy to accommodate them. The menu at Amedros is available in English, and it offers detailed descriptions of each dish, but you can never count on avoiding an allergen by ordering something that just looks safe. My meal there was simple — a green salad, followed by grilled sea bass and veggies, all paired with a light, white Turkish wine — but it was safe (and delicious!). The staff actually thanked me at the end of the meal for telling them about celiac disease. It was a wonderful evening, and a reminder that Istanbul is full of surprises. My fellow New Yorkers are preoccupied with turkey this week, since it’s Thanksgiving on Thursday, but I’m obsessed with an entirely different Turkey. My trip there was memorable for many reasons. The sheer volume of ancient Greco-Roman sites floored me, even though I’d previously read that Turkey has more Roman ruins than Italy. I visited a few (Ephesus, Pergamum, Aphrodisias, and Hierapolis) and was amazed again and again by their beauty and grandeur. I saw great museums (Istanbul’s Archaeology Museum was simply incredible), and magnificent houses of worship, such as Sultanahmet’s Blue Mosque and Hagia Sophia (the latter was a church, then a mosque, and now a museum, but it’s a place of beauty whatever you call it). There is so much to see in Turkey, and I only scratched the surface by visiting the Aegean Coast and Istanbul in my 12 days there. On the dining front, Turkey presents a challenge for the gluten-intolerant. Bread is such a staple of the diet, and wheat sneaks into a wide range of products (for example, the rice cakes I found in supermarkets contained wheat). Restaurant menus are filled with dishes that contain wheat, from stews and soups to kebabs that are wrapped in a wheat shell. However, there was one very important factor that made dining in Turkey possible for me: the Turkish people I met were wonderful hosts, and everyone — from the busiest restaurant to the simplest cafe — was willing to go out of their way to help me dine safely. The lesson was to be vigilant, particularly because wheat is used so commonly that restaurant staff might overlook it. I learned that the hard way on my first night in Turkey, when I was accidentally ‘glutened’ by the dining room of the small hotel I stayed at in Selçuk. My mistake was in taking the word of a staff member who was a native English speaker (since my Turkish is very limited, I thought I was on safe ground explaining my dietary restrictions to someone who spoke the same language). She assured me that the rice pilav was just rice. When the plate was set in front of me, I noticed that the rice had slightly darker bits of… something… mixed in. “Are you sure this is just rice? There’s no pasta in this?” I asked, and was reassured that it was rice. One bite later and I knew that there was more than just rice in the dish. Orzo pasta, as it turned out. It was a disappointing way to start the trip, but it was a good reminder to proceed very cautiously. Everywhere else I ate, for the rest of the trip, did come up with great gluten-free fare for me — and you’ll be hearing more about that in the weeks to come. In the meantime, happy Thanksgiving to my American readers. And for readers who are celebrating their first gluten-free Thanksgiving, check out this excellent post from Shauna James Ahern at Gluten-Free Girl. It’s official: I’m traveling to Turkey this November. I’ve just started planning the trip, and all I have right now is a return ticket to Istanbul. I’ll be in Turkey for 12 days, and I’m still working on the itinerary. I know I want to spend the better part of a week in Istanbul and a couple of days in and around Ephesus; the rest of the time is still unaccounted for (I’m also thinking about visiting Cappadoccia, or taking a cruise to visit Troy — but with 12 days, not everything can fit into the plan). If you have already visited Turkey and have any recommendations for where to stay, what to see — and especially, where to get a good gluten-free meal — I’d love to hear from you. In the meantime, let me tell you what I’ve discovered so far. Neither of my favorite translation sites, Google and BabelFish, offers Turkish-to-English translation at this time, so I’ve been using Babylon, which gets the gyst of things but seems to miss many words. The Celiac Association of Turkey (Colyakla Yasam Dernegi) has a website that is available only in Turkish. (I’ve e-mailed the association for advice, and I’ll let you know what I hear from them.) Fortunately, Celiac Travel, my favorite site for celiac translation cards, has one available in Turkish. 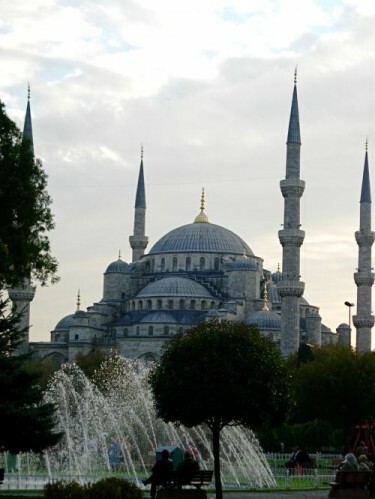 One great resource I’ve found is a website called the Turkey Travel Planner by Tom Brosnahan. I’ve met Tom several times (we’re members of the same writers’ organizations), but it was a pleasant surprise to discover his well-written and comprehensive site. Not only does it cover what to see and do, but there are specific pages of interest to celiacs and the food-allergic: “Gluten Intolerance (Celiac) in Turkey,” “Food Allergies in Turkey,” and “Food Allergy Awareness in Turkey” (there’s also a section for vegetarians). My Frommer’s colleague Lynn Levine, author of Frommer’s Turkey and Frommer’s Istanbul, also runs a website called Talking Turkey. There’s no celiac-specific information, but there are good overviews about Turkish food and drink, as well as pages devoted to regions of the country, museums, spas, and shopping. I’ve started reading the Turkish Daily News, a 47-year-old English-language newspaper that can be read online. An article from February 2008 mentions Saf, an Istanbul restaurant where “all dishes are low in salt and fat, raw, organic, gluten free and vegan.” I can’t wait to try it. In the article, Saf’s address is listed as: Akatlar Mah. Cumhuriyet Cad. No:4/6 Club Sporium, Akatlar; the phone numbers listed are 0212 282 79 46 and 0212 282 72 91.